Signs are something that we see every single day when we are out and about in our communities. Seeing a sign can be an indication that you are somewhere familiar, that you are near home. They define our experience of place, especially places that we come to know and love by the signs that make up our experience of that place. In this way, signs are an incredibly local experience. That is why a sign company should also be local. Sign World creates the opportunity for its franchisees to create a local experience with their Sign World franchise. By opening up a local shop, the owners are immediately invested and interested in the local community, its economic health and the local signage landscape. Instead of a larger chain brand with headquarters thousands of miles away, with a Sign World franchise, you know that the owner is local to the community, and cares about the place itself, and the people in it, not only business. If the owners of a business are located where their business takes place on a daily basis, and gets to see the ins and outs of every day operation, they will be more invested in creating a better experience for everyone involved. Combine that with the fact that because they are local owned and thus inherently invested in the good of the local community, you are left with someone who cares deeply about the people involved with his or her business. So as a business owner looking to purchase a sign for your business, where do you fit in to all of this? Well, when you choose to go to Sign World with your business, you are guaranteeing that you will be served by someone who cares about you, and wants your business to flourish. Local business owners want other local businesses to do well. If your business and the others around it are financially successful, the local economy is stimulated, bringing more opportunities for more businesses. This in turn further stimulates the local economy. More people will have more money to spend, and an economically robust local economy will be created. It is a positive feedback loop in which players in local economies all benefit from the success of one another to create a thriving economic system. This is all to say that, when you support local business owners, you and those around you all stand to gain. 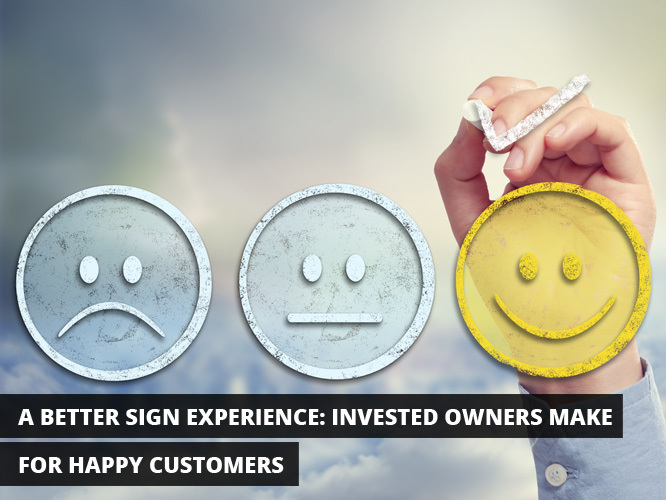 Moreover, by choosing to purchase your sign from a local Sign World franchise, you are going to be dealing with a Sign World owner who cares just as much about the health of the local economy as you do. He or she will live and work locally, and thus want their home to be a thriving environment full of people and businesses that care about one another. To put all the pieces together, by choosing to go to a locally invested business owner, you will get someone who cares about you, your business, and about all of those around him or her. If you want personalized service from owners who will know your name, don’t opt for a large chain with locally disinterested owners. You and your business can work hand in hand with sign world to change the face of your local economy and landscape together, in a way that will make everyone involved in the process happier, and better off for it. To learn more about Sign World franchises, the way they work, how franchisees are selected and what happens next, take a look at our home page. And don’t forget to check out your local Sign World store for the best offers on signage from owners who care.